How do I update firmware on my FX1200? 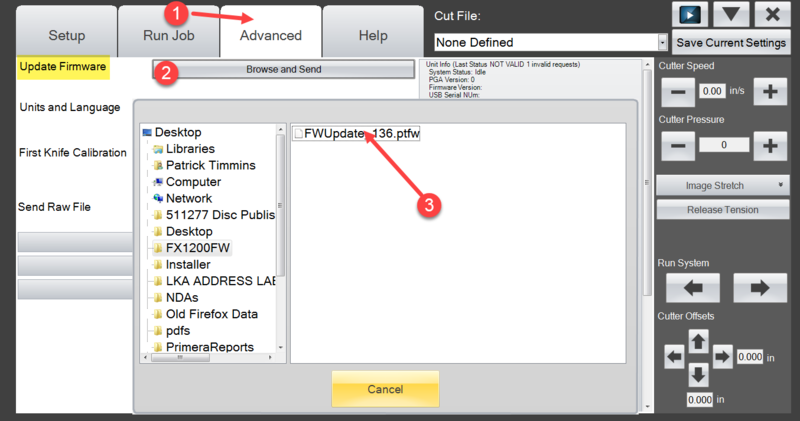 > Knowledge base> Article: How do I update firmware on my FX1200? If you replace a distribution board (140481) or any mandrel location board (140482) you will have to resend the firmware to push the correct firmware to the new board. 2. Unzip the files to your Desktop. 3. Open PTfinish and select the Advanced tab. 4. Select the Update Firmware button and browse to the FWUpdate_xxx.ptfw file on your desktop. 5. PTfinish will prompt you once the update is complete.